On my latest trip to the dollar store I found cute pink frames that are just perfect for Valentine’s decor, or any decor! If your dollar store doesn’t carry them don’t worry, they’re just pink shadow box frames without the glass. You can easily make your own by picking up a frame at your local craft store. If you came over from another blog in the hop and clicked on the link for CraftCreateCalm, that me! I’ve just done a little redecorating around here and that included a name change for my blog. I’d love to have you follow me on Facebook too! You can head over to CraftCreateCalm where I share family friendly activities, or to my new page for the Moments at Home DIY where I share DIY crafts. I added a little bling to the hearts in the frames because they’re part of a Bling on the Love Craft Hop. Check out the links to more blinged out crafts at the bottom of this post. If you’re using a shadowbox that doesn’t have the clothes-pin you’ll also need wire and a clothes-pin. You can skip those if you want to glue your heart directly to the inside of the frame. Remove the back of the frame. Cover the part of the backing that will face inside the frame with white paper and glue in place. Attach the backing to the frame. If you’re using the frame found at the dollar store you may need to remove one side of the wire to put the paper on, then reattach it when you’re done. Paint the wooden heart ornament blue and let it dry. With the beads still on the string, carefully glue them around the edges of the painted heart. You may need to cut off any extra beads with scissors. Let the glue dry. 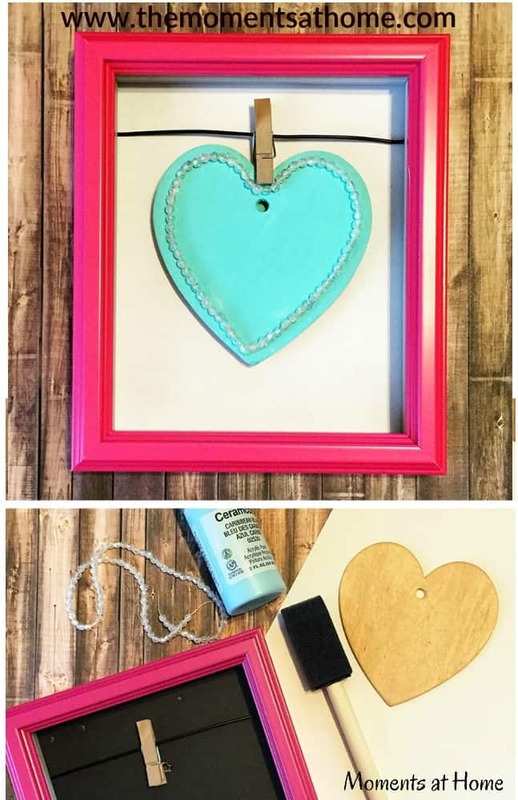 Use the clothes-pin to hang the heart inside the frame. Make these hearts in different colors andn add them to a child’s bedroom decor or as a pretty addition to your Valentine’s day home decor! This would be fun with photos too! This little frame and heart is super cute for Valentines day. I like the idea that you could remove the heart and replace it with the next season. I can see a little rabbit paper printable in the same frame. Nice idea. A very sweet idea! I love it. Thanks for sharing. It would be fun to make the frame to leave love notes on the kids’ doors every day. Thanks, for the crafty info, looks colorful. Would put a smile on my families faces. This is a really cute lovely frame. This is just so cute and a touch of whimsey, it sure makes decorating fun! I’d love to try it! I love this idea so creative. My family and I will have so much fun doing this DIY. Thank you for sharing. I have been looking for wall decor ideas! This looks so simple! That is so simple yet adorable! Thanks for the idea! I love the clothespin idea. This is something my girls could work on together. I like this idea. It would be so easy to switch out the heart for another holiday shape. Oh I love that….simple yet beautiful! I have a place I should make these for to hang up for Valentines day! I love this frame. It’s so simple and colorful. Thanks for posting! I love this idea, great way to display your Valentines! I love this. I now have a new project. I am so into crafts. I am not very crafty but this looks easy enough for me to do with my granddaughter. I do love the shadowbox idea! So much can be done with them! This is a cute frame. It would work with photos and love notes too. This is too cute! My girls would enjoy making these!